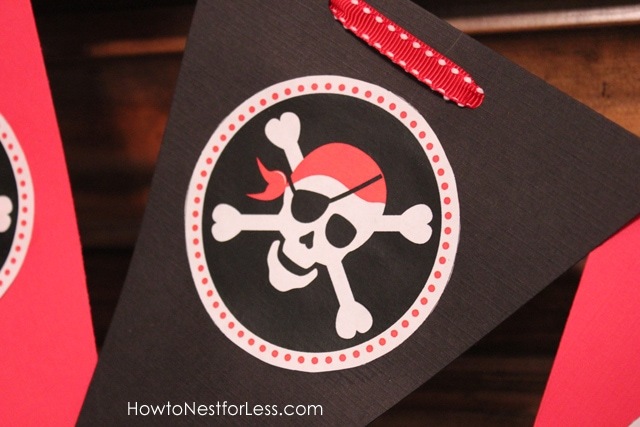 Pirate Themed Birthday Party with FREE printables! For this birthday party, I created an invitation, some food table cards, a birthday banner, water bottle labels, and cupcake/favor bag tags. Let’s get this party started! First up was a birthday party invitation! Above you can see what I sent to print: a 5×7 one-sided card. Below is a blank version that you can revise in PicMonkey, Photoshop or even Paint. I would suggest printing on cardstock and inserting into blank envelopes (I purchased mine from Target & WalMart in the past). 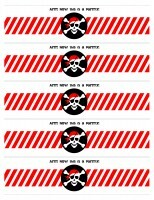 How about a birthday banner for your little pirate in training! 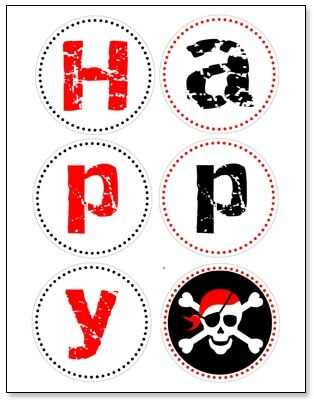 I’ve uploaded a PDF that says “Happy Birthday” along with some fierce pirate spacers. I love the idea of table cards for the various foods you serve at your party, especially if you have guests with allergies. The printable leaves the bottom blank so you can customize to your menu! 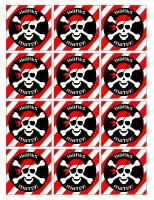 Add a little pizzazz to your cupcake with these pirate toppers! Just print, trim out, tape to toothpick and TADA! Or you can use a hole punch and attach these to little treat bags with ribbon. 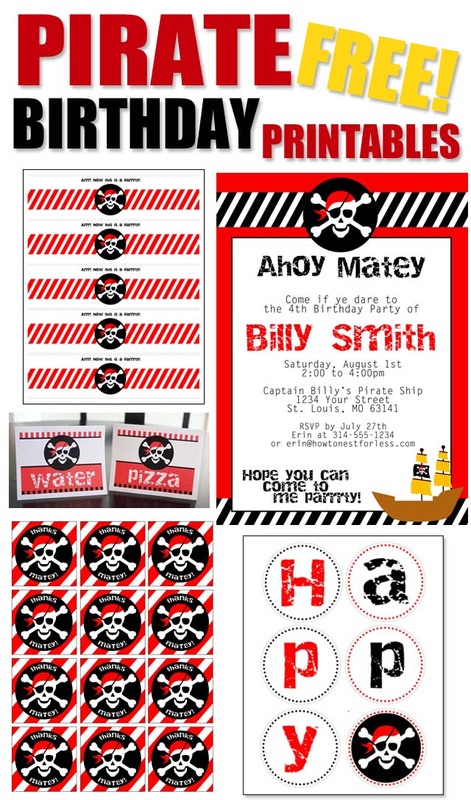 I hope everyone enjoys the FREE pirate birthday party printables! « It Pays to Be Cheap WINNERS! These are so awesome!! I had a birthday party for my 4 year old son last year and it was pirate themed. 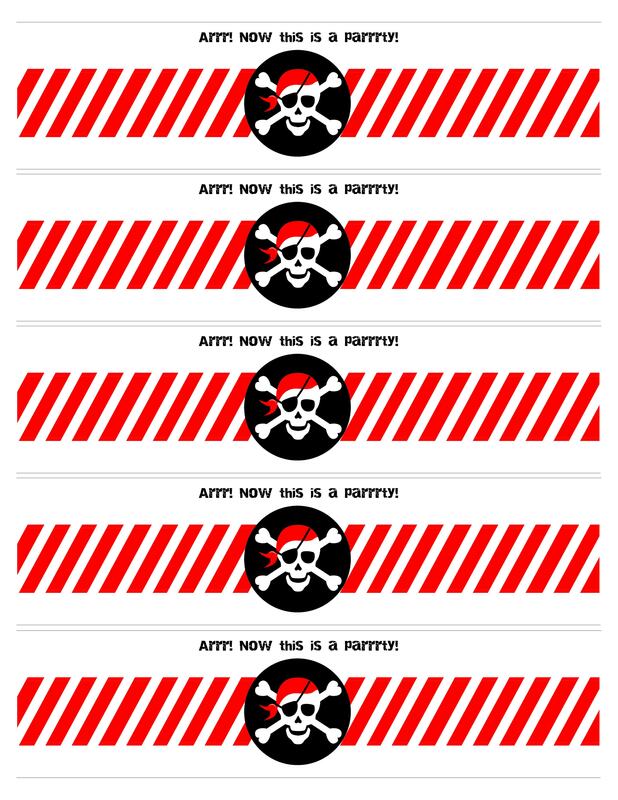 I purchased the invite, cupcake toppers, etc……I wish this post had existed back then! I’m going to use this for my 2 year old’s birthday next month. You are so talented. I’m so glad I found your site. God Bless you for being so kind and sharing your talent with the rest of us! Thnx Eva!!! with the printouts, its gonna be my best b.day ever!!!! thank you thank you thank you!!!!! These are perfect! Thanks so much for sharing and offering your templates for FREE! My son will be thrilled! Thanks Monica! Glad you can put them to good use! very cute, thanks!! !..but i do have a question about the happy birthday banner, only the “happy” shows up for printing…not the “birthday part”…or am I miss something? Make sure you’re clicking on the “download file here” link for the multi-page PDF! Thanks!!! You are saving me time and money, and my son will be so amazed! thanks! Thank you! 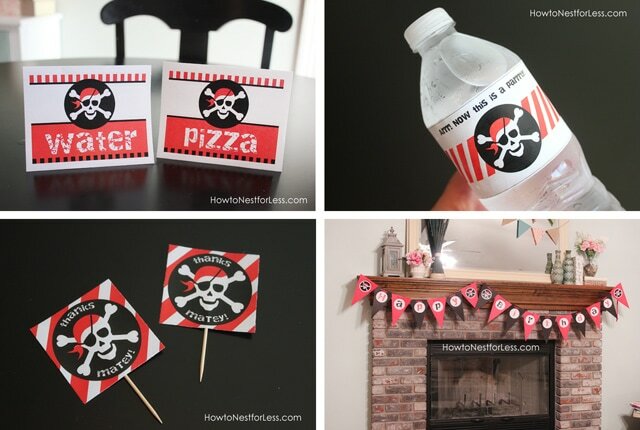 I live in Malaysia and it is hard to find good party shops that supplies these kind of favors… My son, JJ is turning 4 and he wanted a pirate theme birthday.. THANK YOU! I just printed the invitations and making the banner for my son’s 5th bday. Thanks for your printables and ideas! I absolutely LOVE these. 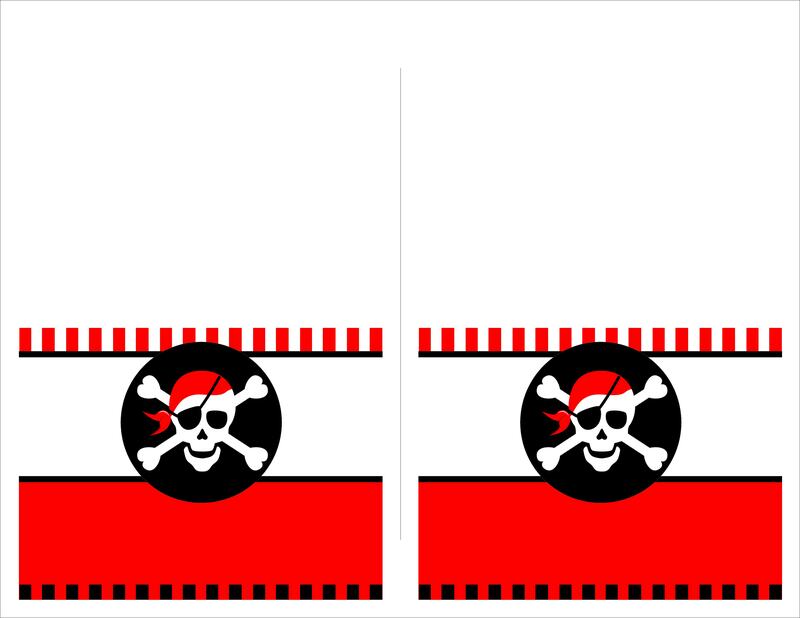 My son’s 4th birthday is pirate themed and I want it to look so cute, but I just don’t have your talent. Thank you so much for sharing with us for FREE! I’m so excited to have his party now!!! 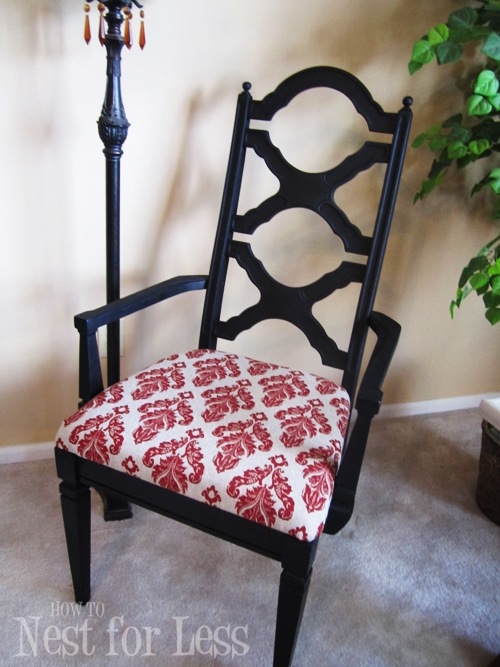 Thank you so much for sharing your ideas and printables! 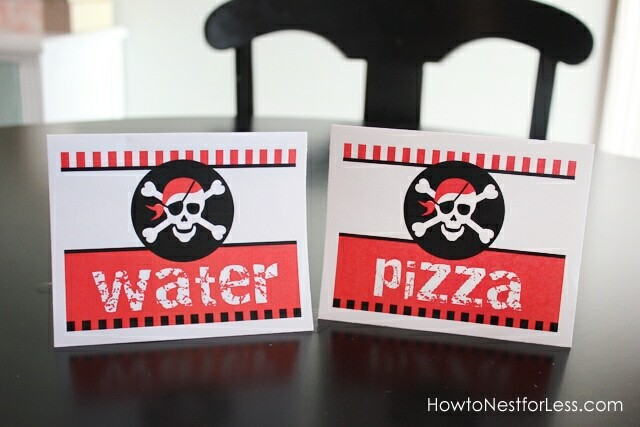 We are having a pirate party for my son’s 4th birthday and I will be using your table cards. The banner is awesome. I’ll gonna use these for my son’s upcoming birthday party. HOLA SOY ANA DESDE URUGUAY ESTOY PREPARANDO LA FIESTA PIRATA PARA FESTEJAR LO 5 AÑITOS MI HIJO FACU , ME ENCANTARON TODAS LAS IDEAS , GRACIAS X COMPAARTIR !!! do you know what the size of the banner triangles should be? Sorry, I don’t have that info. You’ll just have to size them to fit the circles. I used the font Destroy. Hope you enjoy! these are awesome! thanks for sharing matey! 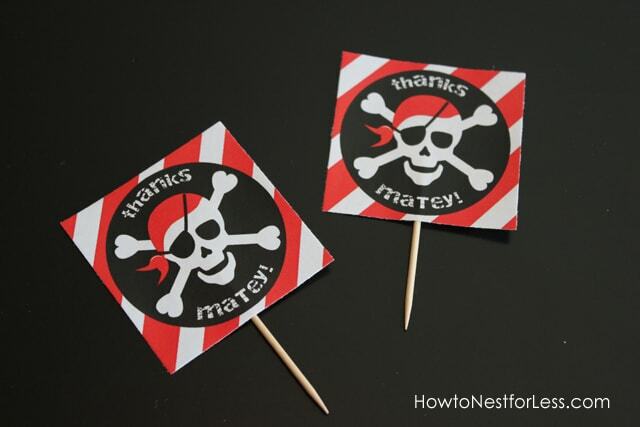 My son’s pirate party is tomorrow and will be way cuter because of your printables! Awesome!! So glad you can use them! Hi there! 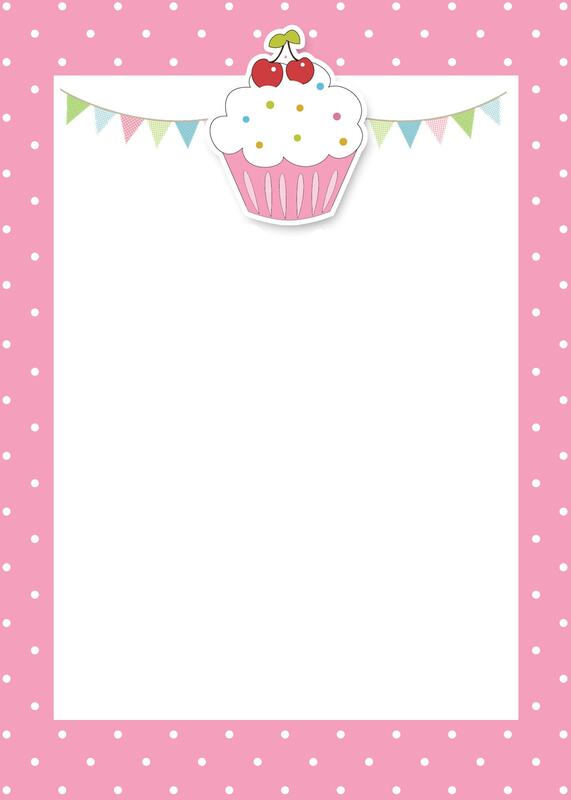 New at this and I love the printables, super cute and easy to download and print. My only question is how to customize the food labels. I downloaded the file and reopened it but was stuck after that. Help!! Open the file at PicMonkey.com or bring into Microsoft Word to type your text on top of the file. Hope that helps! Love this theme. I opened and saved the banner PDF and it looks great. I can’t print the water bottle wraps or table cards…I tried to resize and they become destorted…any advice. Thanks! I’m having the same trouble, I can’t print the table cards or bottle wrappers. I can’t find where it is suppose to say “download here” for those items. I see print here, but they don’t print properly. Any help would be greatly appreciated, these are adorable. Jennifer, click on the image to bring it into a new window. Then right click on the image to save it to your desktop. You won’t be able to print from the website; you will need to open the file in a different application in order for it to print correctly. I hope that helps!! Wow. Thanks so much for the wonderful post. 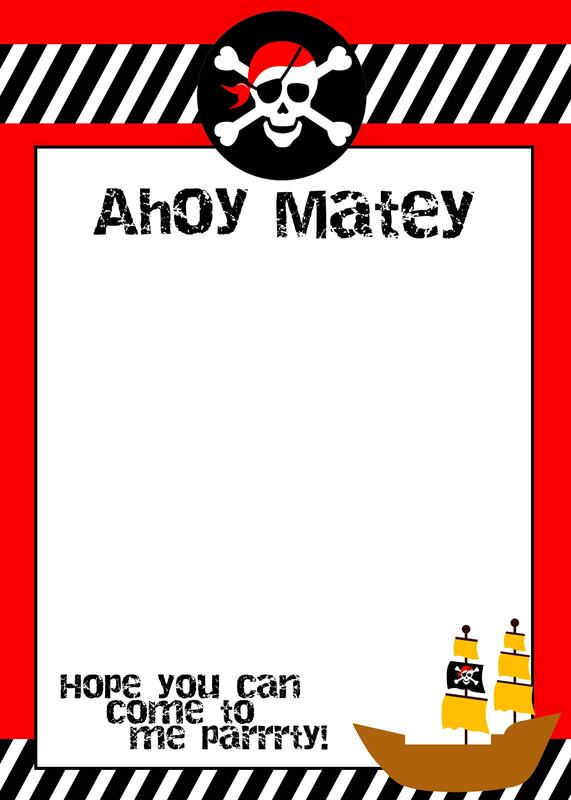 I am going to use the ‘thanks matey’ printables for tags on the goodie bags at my sons birthday. Thanks again, its amazing people like you share with us and can save us a fortune on parties!! Thank you SO MUCH for these! I can’t tell you how much I appreciate it! Thank you so much! My daughter is having a pirate party in October and you are amazing for sharing your time and talent…for free! 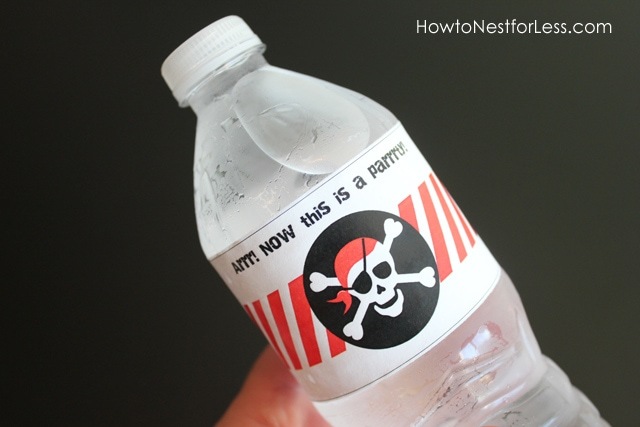 I used your water bottle labels for Back to School Open House. I tweaked them a little in Paint to say “Thirsty for Third Grade”. I’m blogging about my open house and would like to link to your water bottle download. Is that ok? That’s fine Lindsay. Thanks for asking! You’re welcome. I created them in Photoshop! Thanks!! They look amazing, my son is going to LOVE his pirate party! Thanks for these Erin! I’ll be using them for our party next Saturday! Thanks so much for these! That makes it two for two. Last year I used your fireman themed party printables and now these. So easy to use and so incredibly effective. Thank you so much for sharing all of these! It will make my 4 year old’s party extra special! I’m using these for my son’s 4th birthday this week. Thank you for sharing and thanks for giving us the font info. I’m loving the site. So excited! Super cute cake Nadia. THanks for sharing!! Thank you so much for these. I am going to be using most of them. You have saved me loads of money! My son is helping me with your designs for his 7th birthday too! Thank you again! Sorry, not quite sure how to do that!! Thank you a lot! I was looking for something like that for my son’s 10th birthday. 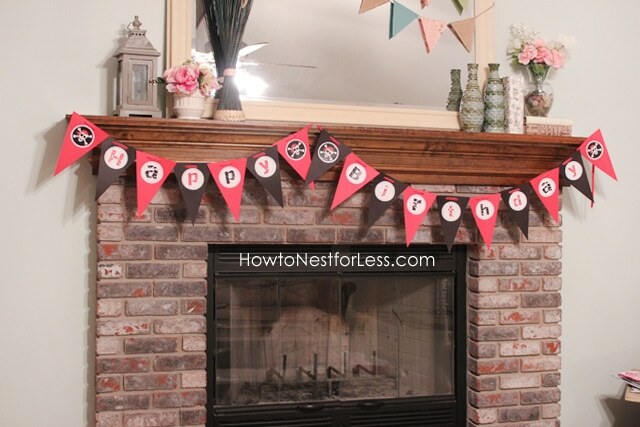 Just letting you know that I used you banner printable for my son’s party:) I pasted the letters to triangles of red craft paper and then stapled them to red ribbon. It looked fantastic:) Thank you! Glad you could use them Mel! OMG!!! thank you so much for the free printable, I have 2 active boys, this is perfect for their birthdays. Glad you could use them! You’re welcome. Glad you could use them! Oh my goodness! Thank you sooooo much! You just helped me out so much! 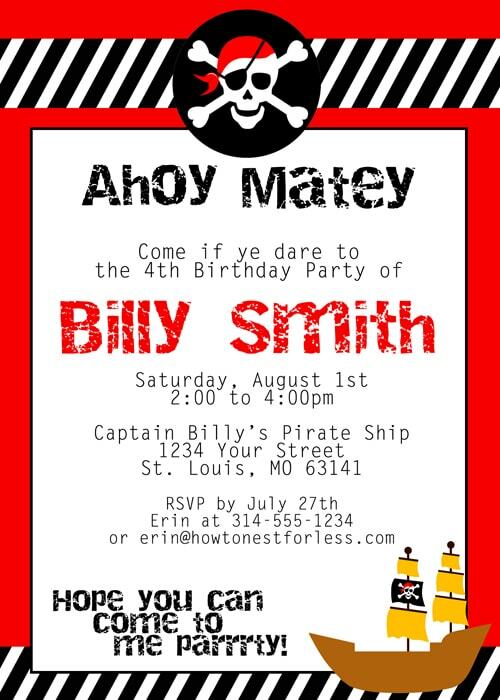 My son’s 7th birthday party is this Saturday and the theme is pirates! My dad built a ship and a jail and the .99 store has their Halloween stuff up already so I got all kinds of skull stuff, skeletons, spider webs but this just tops it! Again THANK YOU!!!! Just wanted to say THANK YOU! 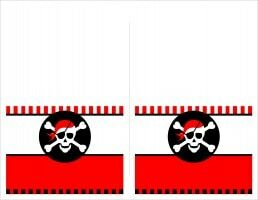 I’m having a pirate party for my two little boys next weekend and the banner template is amazing! The font is called Destroy! I am so glad I found these! Thank you so much for providing them! It took all the work out of creating each thing. Made me look like a pro for my son’s first birthday! People who had never been to our house before came to the party and I used these in so many places to decorate. My son enjoyed it and I had a proud mama day that day! 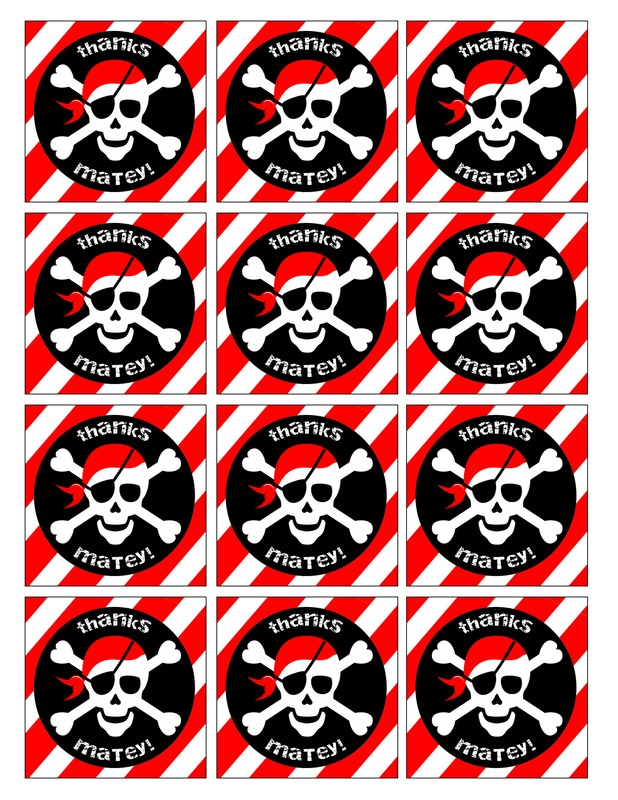 your works are great i would really love to use this for my son’s pirate theme birthday. however, i have a challenge with the skull pirate part..do you cater request to change this to Jack’s and crews instead? would really appreciate it but if not, its okay..your work is really awesome! Sorry, I do not do custom work! Do you have a copyright release. I’m using the blank invite and filled out for my son birthday. However Staples will not print it out for me without a release, even though your website says free printable. Print out this comment and take it up to them! I am the owner of How to Nest for Less and the copyright holder of this printable and artwork. I hereby grant anyone in possession of these images created by How to Nest for Less permission to make unlimited prints for their personal use only. If you should have any questions regarding the authenticity or the terms herewith, please contact us. These are adorable, thank you for sharing! Could you tell me what program you use to create these? …. I’m new to all this and would love to create some myself! P.S. I am also unable to access the ‘birthday’ portion of the banner. I use Photoshop to create my printables!